India’s burgeoning cities are famous the world over for their startling vibrancy – and, sometimes, their startling problems. A new national policy, enshrining more transit-friendly development principles, aims to steer urban planning in the world’s largest democracy towards more compact and pedestrian-friendly neighborhoods and streets. The World Bank projects that India will lead the global urban surge in the decades ahead, adding 404 million urbanites by 2050. However, to date, much of this growth has been unplanned, leading to sprawl and all its attendant effects like longer trips, higher use of private vehicles and more air pollution. The New Climate Economy estimates sprawl could cost India’s economy as much as 6 percent of GDP every year by 2050. Horizontal growth is even cutting into the hinterlands. In 2010, McKinsey estimated that India could save 6.2 million hectares of arable land through more effective land-use planning by 2030. New policy, adopted by the Ministry of Urban Development in May, seeks to shift current practices to encourage denser, healthier, more productive cities. 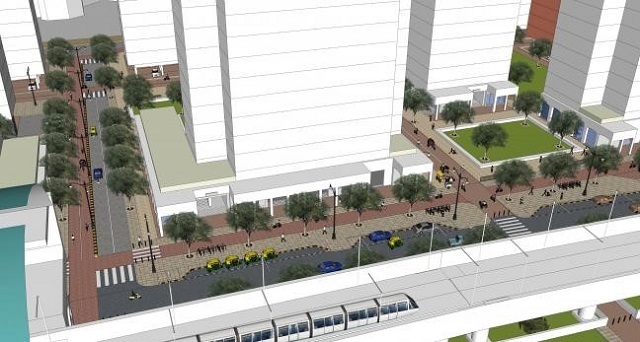 The National Transit-Oriented Development (TOD) Policy recommends transit and land use strategies for compact, mixed-use development, that gives citizens access both to open space and transport services. The National TOD Policy is critical to achieving the goal of livable, well-connected communities. Currently, only a small handful of cities and states in India have TOD strategies. The policy will provide a much-needed impetus to encourage more local governments to implement TOD concepts into their urban planning. Such strategies can spur investment in multimodal connectivity (buses, bicycles, transit, walking, and cars), improvements to pedestrian and cycling infrastructure, and development near transit stations. It might not be too dramatic to say that such an official encouragement may represent an inflection point where compact, coordinated and connected development starts to become the norm across Indian cities. The National TOD Policy highlights the government’s resolve to address issues faced by existing and emerging urban areas. However, the ultimate success of such policies depends on cross-disciplinary integration and partnerships at various tiers of government – not to mention the private sector. Government at all levels should review and revise existing policies and regulations to include TOD and promote better understanding of TOD through communications materials. State governments should direct cities to include TOD in their development plans. If they are already prepared, amendments should be issued. States should monitor progress by setting up special departments for TOD implementation. This will ensure that crucial factors, such as financing and governance, are well addressed. City planners should consider the unique needs of individual neighborhoods and evaluate the best use of existing infrastructure. City governments should also identify and create an inventory of informal housing, so TOD is not a stepping stone to gentrification. The use of transit-oriented development as an urban growth strategy is relatively new in India. Translating policy to action will require a multi-pronged approach. States and cities should take a contextual approach based on local trends, market behavior and city requirements. But if implemented well, the new TOD policy could improve the lives and livelihoods of hundreds of millions.